As an avid chamber musician, Rosanna is a founding member of Trio Alexander (flute, viola, harp) and Sticks&Strings percussion and harp duo. Described as “daring and unconventional”, Trio Alexander has recently returned from their first UK tour having been supported by an Eastman Development Grant and can regularly be seen in concert throughout the East Coast. As a rather novel duo, Sticks&Strings aims to build a repertoire for harp and percussion duos and often collaborate with other art forms. They are currently working on a new show titled God Complex which will premiere in 2018. They were recently awarded the United Kingdom Harp Association Bursary to help fund the project. In addition to her house ensembles, Rosanna enjoys the challenge of working with eclectic ensembles such as Divinity (an Indian classical music group), jazz groups and even the US Army Band. Notably, she has performed for royalty in an ensemble of 60 harps for Prince Charles’ 60th birthday and recently shared the stage with five-time Grammy winning soprano, Kathleen Battle as part of her Underground Railroad tour. As an orchestral musician, she was recently appointed as Principal Harp with the Orchestra of the Southern Finger Lakes and Second Harp with the Rochester Philharmonic Orchestra. Rosanna enjoys working with composers and has both commissioned and premiered works at festivals such as: Huddersfield Contemporary Music Festival, Tête à Tête Opera Festival and Eastman’s Women in Music Festival. 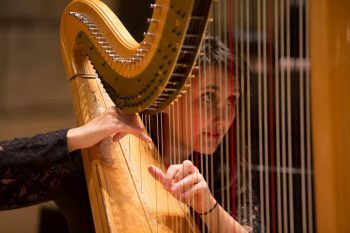 In 2014 she premiered two harp concerti by composers Nicholas R. Conn and Dan Kohane and in 2017, she performed the US premiere of David Horne’s Splintered Instruments. She has worked with numerous contemporary music groups and initiatives such as Sounds of the Engine House (Manchester, UK), The Future Blend Project (Warwick, UK), Ensemble Signal (NY), Ithaca College Contemporary Players (NY), Society for New Music (NY), Ensemble LINEA (France) and OSSIA New Music (NY). Additionally, she served on the board of OSSIA New Music as President in 2015/2016. Finally, as a passionate educator and researcher, Rosanna wishes to bring the harp to as many people as possible. She currently holds the position Harp Instructor at the Eastman Community Music School in addition to being Professor of Harp at Nazareth College. Her research deals with the connection between musical performance and theatre. This recently culminated in being shortlisted for the Lecture Recital Prize at the Eastman School of Music and having her paper published in Contemporary Music Review, both of which explored the relationship between choreography and performance in R. Murray Schafer’s Crown of Ariadne. Rosanna is currently completing the Doctor of Musical Arts program with a minor in theatre and an Arts Leadership Certificate at the Eastman School of Music. She studied in the studio of renowned harpist Kathleen Bride, where she was generously supported by the Eileen Malone Scholarship. Rosanna graduated with honours from the Royal Northern College of Music in 2011, where she studied with the acclaimed Welsh harpist Eira Lynn Jones. Prior to this she attended the prestigious Chetham’s School of Music.